I’m going to publish a series of articles about going barefoot…all over, all over. These will be in between and distinguished from the Trip Reports. Some will be informational. Some will be experiential. I have been experimenting with bare feet for several years now. There is much that I would like to share and hopefully benefit the reader. These will appear from time to time. Presently, some are written, some outlined, some in pieces. I’ll attempt to keep each short. SAND! Oh, I had a glorious morning’s stroll. I awaken early, I expect a chill, but the sun feels warm. We have had three days with intermittent nice soaking rains. The humidity is up. There is silver crystalline dew on all of the fresh tall grasses, which have grown up from the monsoon. I put on my huaraches to be minimal and take off, in a purposeless state, just experiencing, thought nor plan isn’t an issue. 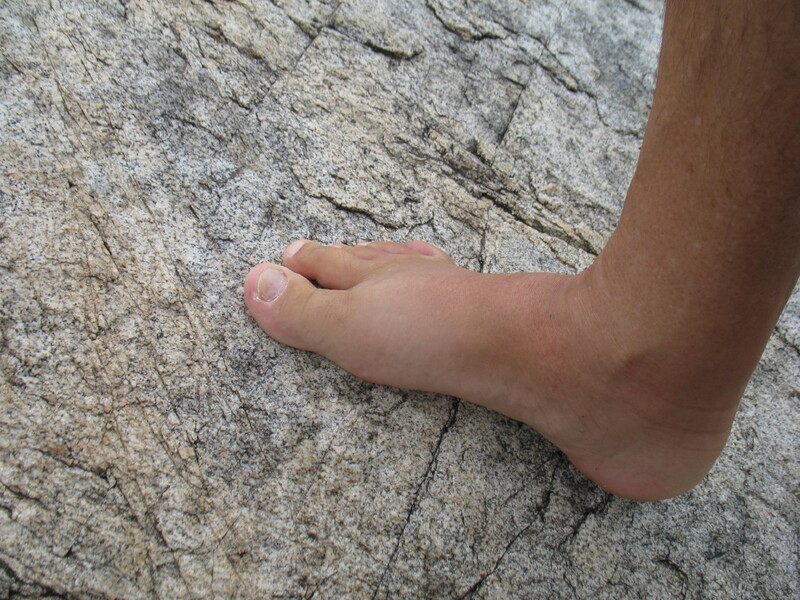 The thin leather sole gets wet and soft, conforming to the rocks. I stare at a set of flowers in the trail. There are clover-like balls coated with moister and glistening in the morning sunlight. They are filled with prism colors. With these, are daisy-like structured flowers, rich purple with a bright canary yellow center. The dew has these coated, too. It gives them a glassy look. I walk up one branch of the old jeep trail, thick with grasses, two tracks making a pair of paths. I take my pick of conveyance. The vegetation is thick from the monsoons and green everywhere. Occasionally, I see a golden plant with leaves falling. There is a leaf hanging in a spider’s thread, under a tall bush, spinning with the delicate breeze. Its shadow dances near it. There is no sound, I see no man-made structures around me. Out of this, suddenly, the roar of Friday morning pops out, dancing above the plants. Where I have climbed, up on a hill along the way, it soaks in. The rains have removed soil and sand to create a gully in the road, where the jeep trail had been graded. I have been seemingly led, without thought, to try the other fork of the small wash, which created this. There is finality to a process that has been occurring there in the stream for years. In the one fork, the sand is at last, all gone. Water has ponded on a sheet of bare granite surfaces. The other fork is sandy, fresh and still moist. I take the sandy wash as a nice wide clear path. I soon leave the huaraches behind, sitting in the wash, as if I had just walked out of them, or suddenly my body had disappeared leaving only shoes. The sand is wonderful. It is stiff. The stream is still slightly running, here and there. I sometimes sink down into the sand, just like wet sand on a coastal beach. It squishes between my toes. I pat it with my feet, tapping, smoothing out its contours. All is washed clean. A few tracks have been left, but all in all, only mine are there on this virgin path. I continue, there is a long slab of granite. Its features are many textures. Sometimes a sharp ridge, sometimes smooth, it massages the sole of my feet. I watch as my feet twist, coordinating with body, and am amazed how intricate the automatic movements are, these which propel me through various circumstance. I dip my feet, one at a time, into pools to get the gritty sand off, so it won’t make a stone surface slippery. Then, I step onto the rock surface wet and clean. Climbing from stone, to boulder, to granite sheet, I make my way, one step at a time, smelling the aromas, occasionally looking about, but mostly just watching those feet, feeling each move and surface change, fascinated with the awareness of the moment. I continue until, mysteriously, I know that this is as far as I will go. When I arrive at that pond, just off of the jeep trail, I continue. I thought of Bob who had had a broken strap, continued barefoot and never looked back. My feet have come a long way toward conditioned. I decide to give the difficult hard crumbled stone surface a test. I have never been barefoot there, as it was too much a challenge. One step at a time, no goals, I climb the coarse surface. I step on the prickly grass that gets other times would get stuck in my socks. It is moist and cushions my steps, absorbing much of the sharp rock edges below. I wonder if the ancients, who made shoes out of reed grasses, got their idea from such an experience. Wandering to my door, I turn to walk just a little bit more, on a different rock’s surface. Yes, it is very different. What a diverse palate we are gifted with to walk on. I sit conditioning my feet with Bag Balm, massaging deeply. Rewarding them, helping them to get better still, becoming well acquainted again and feeling quite lucky. Healthy feet can hear the very heart of Mother Earth.